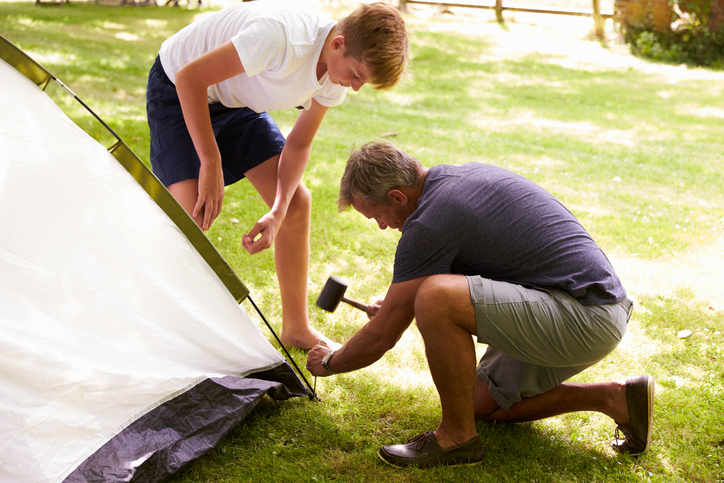 Make sure you peg the tent down firmly! A peg is a wooden or plastic pin driven into something and used for fastening or support. In British English, a pin used to fasten washing to a line is a peg (in US English, this is called a clothespin), and informally, a leg can be called a peg, although this is now dated. A peg is also a degree or level and, in US English, it is a hard throw, especially in baseball. As a verb, to peg means ‘to fasten with pegs,’ ‘to keep at a set level,’ and, in US English, ‘to throw hard.’ Informally, if you peg someone or something it means that you classify or label them. We used pegs to secure the tent. There were three pegs holding the sheet on the line. Brian's pegs were aching after his long walk. Susan was a haughty woman, who needed to be brought down a peg or two. The player's peg to second went wide. We pegged the clothes on the line. Interest rates are pegged to inflation. From the day I met him, I had him pegged as a great guy. A peg, or foot peg, is also what you call the footrest on a motorbike. Also, while pegs is outdated slang for legs, a peg leg is a colloquial term for a wooden leg, like pirates have in stories. A peg is also a sort of hook that you can hang a coat or hat on and, by extension, figuratively, it can be a theme for something, because it’s the thing everything else hangs upon. In journalism, in particular, where it is also sometimes called a news peg, it is an underlying story that an article, feature, cartoon, etc. is based on. Peg dates back to the early 15th century. The late Middle English noun pegge came into English from the Middle Dutch pegge (meaning peg), though it was a common word in Low Germanic languages around that time. It is related to the Low German pigge (peg), the German Pegel (gauge rod or watermark), the Middle Dutch pegel (small knob used as a mark) and the Dutch peil (gauge, watermark or standard). Its origin is uncertain, but some linguists think it may have evolved from the Proto-Indo-European root bak– (staff), which would make it related to bacillus. The verb comes from the noun, and dates back to the late 16th century. The expression to take someone down a peg (or notch) dates back to the late 16th century, while square peg in a round hole is from the early 19th century.